Hey it's me again! My goal today was to make a whole bunch of random cards and post them as I finish them. When I mean random. . .I mean making cards without a plan. . .sort of just pick up materials and just put them together. Sometimes when I think about what I want to make, I end up not making anything. I've been suffering this problem for a while now. Today I decided to just go for it and try to use up a bunch of my scrap "designer papers" and just create something whether the materials really match or not. Everything but the lace (which is a scrap lace I've had for a while) and the button/shoe lace ribbon are materials by "K&CO". I had fun with this card. What are your creative plans for today? Anyway, let's see what else I can make. Until later, folks! Very nice. I like the added lace. I love all your cards...always..but I have to admit today this one really tickles my fancy..Gorgeous!! I love lace and am always looking for ways to use it. I have a ton of lace in my stash from my sewing days...and I was just looking at all of it a few days ago. 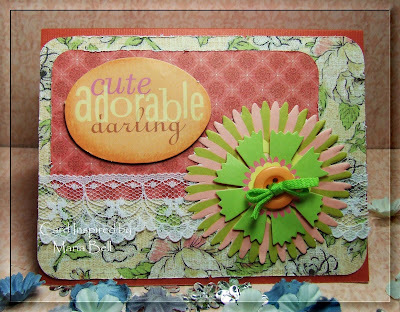 Very cute card and that flower and lace are beautiful!